Now it's WiFi, MySpace, video games, satellite TV, iPods and cellphones but back in the early half of the 1950s it looks like all the alley had to pass the time was a game of cards. In the crowd we see Emmett (front and center) Kelly, Otto Griebling, Felix Adler, the Hanlons, Charlie Bell, Freddie Freeman and Prince Paul. "Jack was a close friend of my dad. They trouped together on Howard Suesz's "HAGEN BROS. 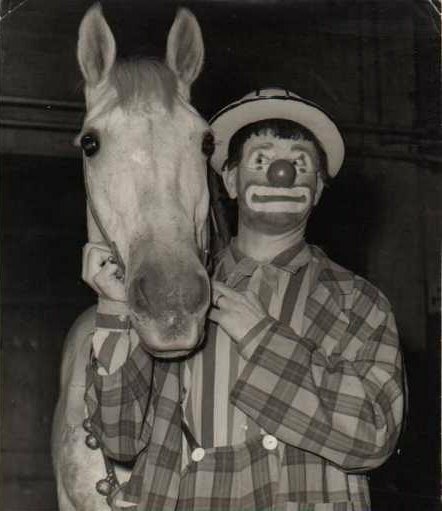 CIRCUS" back in the late 1950's. 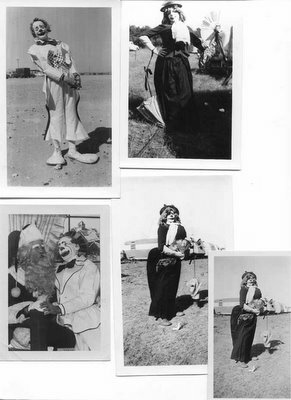 At that time, my dad was spending his vacations away from his towner job on the road with the show, clowning. The Hagen show came and went before I was old enough to know much about it. I have some pretty good 8mm film that my dad shot around the show and included in its content are a few shots of Jack.As a kid of maybe seven or eight years old, I remember my dad and I driving out many times to visit Jack and his wife at their home, somewhere outside of Chicago (for some reason Wheaton, Illinois rings a bell). 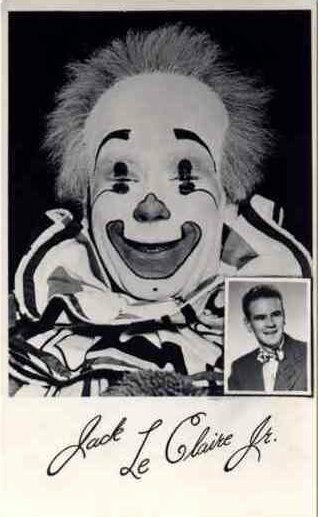 By this time (about 1964-ish), Jack had pretty much retired and was staying in one place, clowning a date here and there and agenting for the MILLS BROS. CIRCUS, as well as Suesz's indoor CLYDE BROS. CIRCUS when they would hit the Chicagoland area.How well I remember listening to their conversations about circusing and clowning. Often times we would plan our visits on the same night that Don Ameche's TV show "International Showtime" aired... all of us huddled around the TV like schoolgirls watching the Beatles on Ed Sullivan! Whenever the clown numbers would come on Jack would begin reminiscing about the various gags he had done over the years. It was just great.And, even as a kid, I knew well enough to take it all in.Jack clowned on a few of my family's first circus dates when we started our show. Believe it or not, I actually had the chance to work with him in a couple of gags. He seemed to get such a kick out of the fact that I was so into what I was doing. 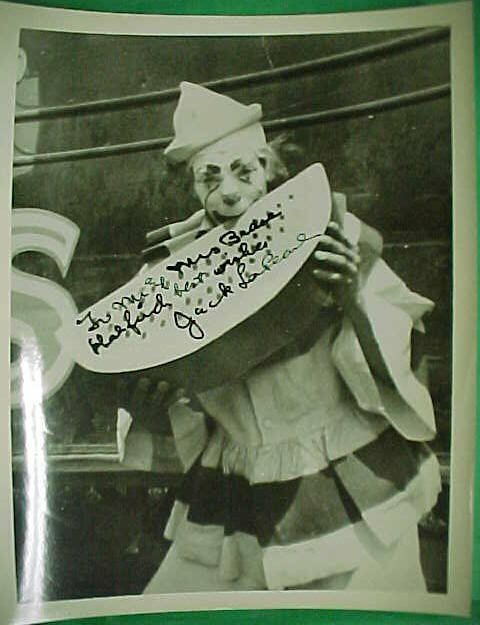 I don't really remember a lot of details, as it was so long ago, but I do remember him as being a pretty down-to-earth character that really loved the circus and clowning. 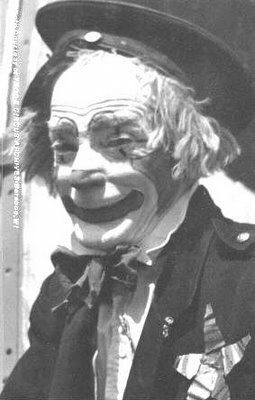 —Tim Tegge"
Another clown cop, Charlie Franks, from a blow up of a photo taken at the 1952 Hamid-produced circus at the Steel Pier in Atlantic City, NJ. His Chalinesque makeup reminds me of Doug Ashton, Mark Stolzenberg and Kochmanski. Bill Strong (who supplied the photo) tells me he did the eggs from the mouth bit for a walkaround and was still working up until a few years ago. Chuck Burnes who spent several seasons on Ringling, several years on ice shows and now runs Periwinkle Productions out on the Left Coast. 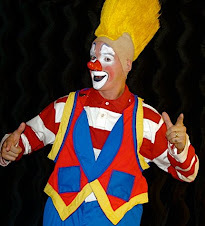 He's a regular contributor to Circus Report and his son Chipper is a successful variety entertainer. Here's a photo that raises a few questions. Here we find, seated atop a cage wagon, (from left to right) Unknown, Paul Wentzel, Felix Adler, Jack LeClair, Lou Jacob (before he added the "s"), Unknown (possibly Shorty Flemm?) and Paul Jerome. 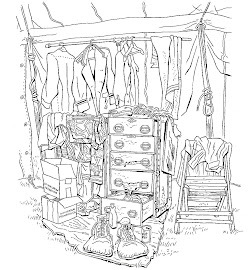 OK, what do we know from looking at this picture? 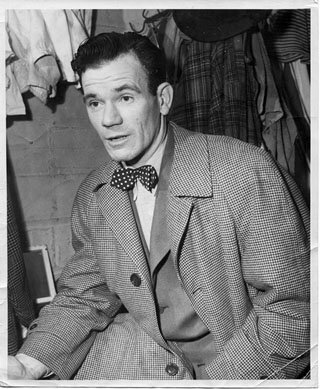 It was most likely taken after 1937 as Jack LeClair has changed his makeup and Paul Jerome is no longer wearing his whiteface. Is it a photo from spec? I don't know. 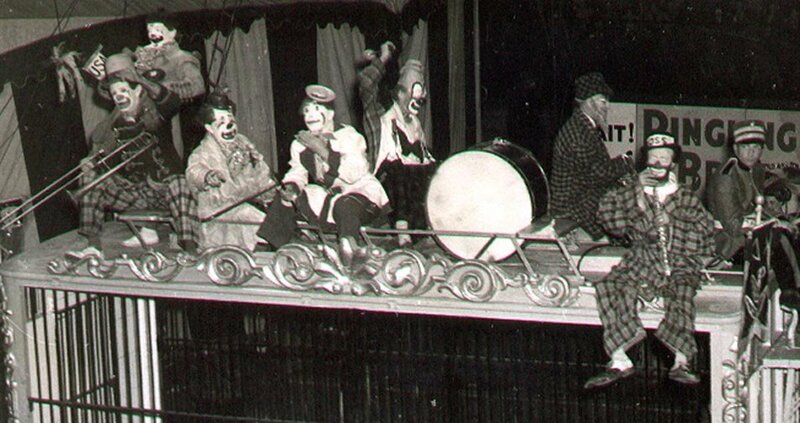 Why would the clowns be riding a cage wagon during spec? Is it from a street parade? Could be. There is a Ringling "Wait" poster behind them. But why would they be in a street parade after 1937 and why would there be that striped sidewall behind them? Indoors, outdoors, possibly just a photo op? I don't know. Anyone have any more info or insight into this one? I tried to comment on your blog and I didn't want to set up a blog for myself in order to comment on yours. I am trying the email route. I don't know if the one I sent earlier went through or not so I will try this way. This photo is from 1943. The first display in the 1943 program for Ringling was a recreation of the old time street parade. It was called "Hold your horses....". They used about 5 or 6 cages with two and four horse hitches and a couple with elephant hitches. Also included was the new Liberty Bandwagon with a 6 horse hitch and a few assorted small vehicles and riders. The posters were set up around the Garden and Big Top to give it an old time circus parade down Main St. USA atmosphere. The cage the clowns are on was # 73 pygmy hippo cage pulled by a four horse hitch. Joe Bradbury covered this in his terrific series on Ringling in the White Tops many years ago. 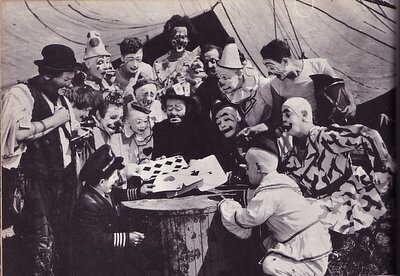 There is even a photo of the cage and hitch with the clowns in almost the same position as your photo. I hope this helps to answer your questions. Good luck with the blog. The heavily edited presentation of Lou Jacobs classic clown car gag as it appears in Cecil B. DeMille's film, The Greatest Show on Earth. Footage of the Rastellis from what appears to be the 1950s. 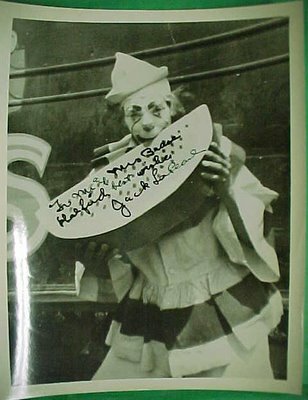 ICHOF inductee Jackie Le Claire early in his career before he'd settled on his trademark whiteface makeup or his stage name. This early version of his makeup makes me wonder if he ever showed these pictures to early Ringling Clown College graduate Keith Crary? 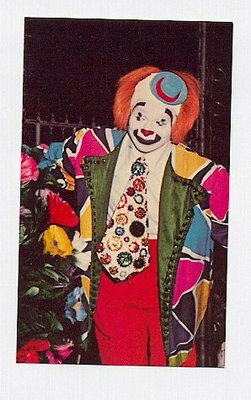 Keith was always very classic in his makeup and his costumes and was one of my favorite whitefaces as a kid seeing the circus at Madison Square Garden. A Ringling billboard featuring Keith stood unchanged in my town for YEARS before it was replaced. 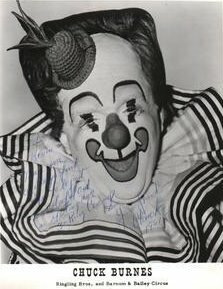 ICHOF inductee Irv "Ricky the Clown" Romig in and out of makeup. 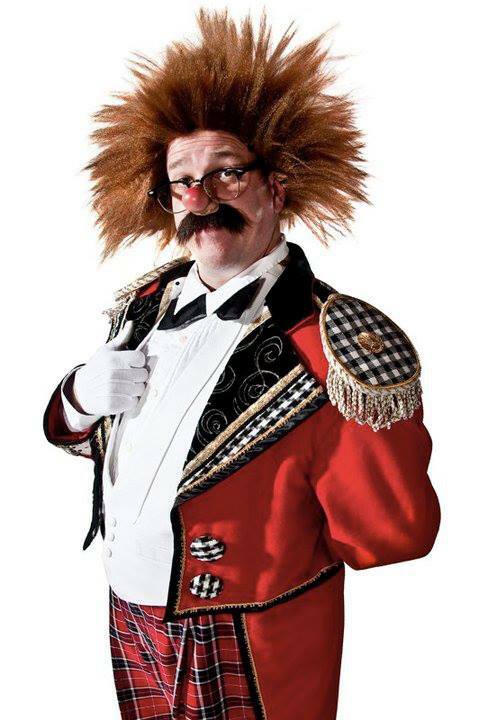 A veteran of many shows, he enjoyed a 22 year association with the Shrine Circus and 12 years as a Detroit area kid show legend becoming WXYZ's favorite TV clown. 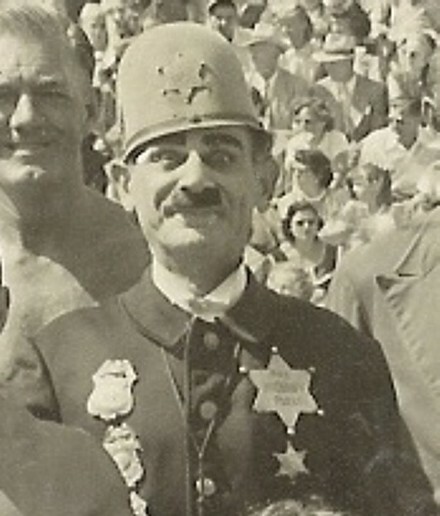 His comedy mule act appears in Cecil B. DeMille's The Greatest Show on Earth.